Description: Compactly tufted perennial to 0.7 m high; culms erect, stiff, unbranched. Leaves with ligule membranous, very blunt, 0.5–1.5 mm long; blade 1–4 mm wide, ribbed on upper surface, sometimes hairy, lower glossy. Panicle spike-like, erect or slightly curved, dense, stiff, narrow-oblong, 1–14 cm long, main axis rough or minutely hairy. Fertile spikelets surrounded by sterile ones, 3–5-flowered, oblong or cuneate, 3–6 mm long; sterile spikelets ovate but spreading at maturity, compressed, 4–6 mm long with glumes and lemmas arranged in 2 opposite rows. Glumes persistent, keeled, narrow, acute, 3–5 mm long, 1-nerved; lemmas rounded on the back, oblong-ovate, 5-nerved, awn c. 1 mm long. Palea slightly shorter than lemma. 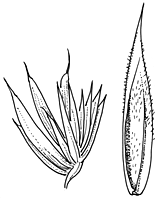 Distribution and occurrence: Weed of waste and cultivated areas. Native of Eur. & SW Asia. Other Australian states: Vic. *Tas. *W.A.